Ed Notes Online: OT/PT contract vote with less than 48 hours notice, only one day of voting, and at only five locations citywide! 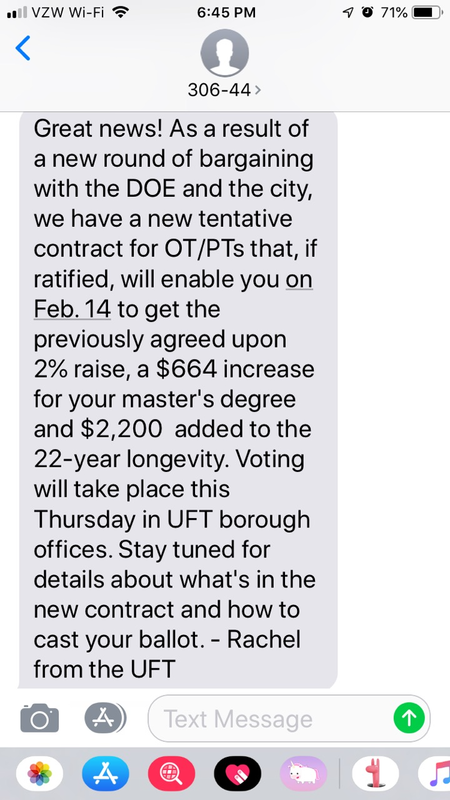 OT/PT contract vote with less than 48 hours notice, only one day of voting, and at only five locations citywide! I thought you might be interested in seeing this text that just came my way via an in-service CL friend. 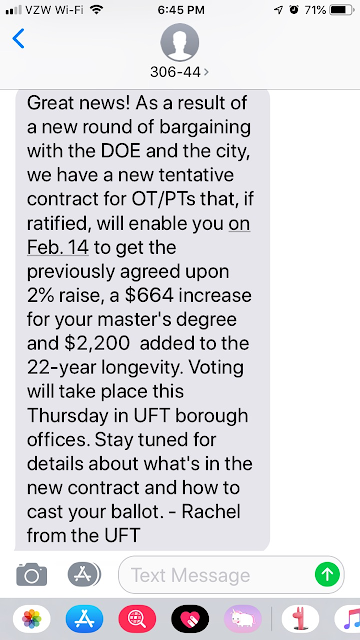 OT/PT contract vote with less than 48 hours notice, only one day of voting, and at only five locations citywide! (Not to mention the strictly chump-change "improvements.") When it comes to voter suppression, Georgia, Florida, and Texas have nothing on the pros at the UFT! Here is the UFT missive hailing another round for democracy in the UFT. I'd also point out that this bargaining took place behind closed doors, without any rank and file input, and the paltry increases do next to nothing to bring OT/PTs up to parity with the wages and benefits of other related service providers. I don't even believe that, as of this writing, any of the proposed contract and voting details have been directly shared by the UFT with the functional chapter members. And one day of voting? More like three hours - if you can drop all your plans and get to your borough office between the end of the school day and the close of UFT business hours. The message from the UFT stressed that we would need our UFT membership cards to enter the UFT building, which is not and never has been true (you just need picture ID). The guard on the first floor stalled people asking if they had received their UFT cards, when they said no, he insisted they must have gotten them, when I showed him that I had downloaded the UFT app, but not added my personal information, he wanted me to fill that out then and there---I finally just asked if I could please do it later and he reluctantly let me and the others go up. Why would they pick this one day to enforce that?I I can only think they must have been hoping people wouldn;t vote. Besides it being a polar vortex, so it was literally dangerous to be outside, but they said the rush was so we could get our 2% raise by Valentine's Day. So sentimental!!! Important points Bennett - and the weather will also be awful. They couldn't care less if 10 people voted and the vote was 6-4 in favor - it would be passed. They don't care if OT/PT are pissed off. Only thing that would work in future is for OT/PT to start a campaign to leave UFT and get a new bargaining agent -- that would be a radical move and extremely unlikely. Really at this point everyone is in a box. The only thing we had going was the idea to build a formidable opposition but that is dead.